In an effort to help our publishers navigate the array of Google products, we’re happy to announce the first part of our ‘Additional publisher resources’ video series. In these videos we aim to provide an introduction to other Google products that are of interest to AdSense publishers. We’ll cover topics such as how to maximize your site’s visibility to advertisers, how to ensure your site is properly indexed in Google’s search engine, how to make your site more interactive for users and how to gather information on your site’s traffic. In the first part of our video series the AdSense team’s own Vijay Vachani will walk through the ins and outs of the DoubleClick Ad Planner. Vijay will explain how advertisers find information about your site through the Ad Planner, and how you can take advantage of the features available in the Ad Planner’s ‘Publisher Center”. In the last post in our "Bridging the Gap" series, lets explore how advertisers build tailored campaigns to promote their businesses. My team and I work mostly with medium-sized businesses that try to be as efficient as possible with their online ad spend. In the past, we found that direct response campaigns (which ask users to make a purchase or sign up for a newsletter) were more common than pure branding campaigns. However, I've seen firsthand that advertisers are slowly but surely beginning to understand the value of online advertising as an extremely cost-efficient, effective and measurable branding mechanism. As publishers, this means that you'll have more opportunities to capitalize on the increased ad competition that brand campaigns bring. Below I'll explain what types of brand campaigns we see, how advertisers select publishers to include in brand media plans, and how you can ensure that your sites make it in. The most important difference between direct response and brand campaigns is that brand campaigns aren't focused on driving direct conversions. The goals of online "pure brand" campaigns are very similar to offline ads: reach a specific audience with a sticky message that builds recognition, favor, and/or credibility of the brand. Another type of brand campaign called "brand response" aims to reach a targeted audience and elicit some form of action. Common types of brand response goals include increased searches on brand terms, unique visitors to the advertiser's site, and user interaction on site. *Though placement targeting is the traditional method for branding, we are seeing a lot of successful brand response campaigns running both placement AND contextual targeting. Does it have a high composition of their target audience? Does it have highly visible, above-the-fold inventory? Does it accept image, flash and video ads? As mentioned, brand campaigns are great for publishers because advertisers are willing to pay a premium for sites they want to show on. This means more revenue for you. One of the best ways to maximize the chances of being included in a media plan is to update your site information in the Ad Planner Publisher Center. Google Ad Planner is the media planning tool advertisers use to select inventory on the content network. Ad Planner allows advertisers to filter sites by audience composition, accepted ad formats and sizes, reach, unique visitors and daily pageviews. the roll-out of Google’s next generation ad server, DoubleClick for Publishers (DFP). Today, we completed the upgrade of Google Ad Manager publishers to DFP Small Business, a streamlined version of DFP designed to meet the needs of growing publishers, and we made this platform available globally to all publishers. If you’d like to sign-up online, you can do so now by visiting the DFP Small Business website. You can also learn more about both versions of DFP by visiting our main product page. As you may know, publisher ad servers like DFP help website owners better manage and deliver ad campaigns they've sold directly to advertisers as well as ads that are allocated to third parties, such as ad networks. The DFP platform also integrates directly with AdSense and the DoubleClick Ad Exchange to provide an even more dynamic solution for managing advertising from multiple sources. The new DFP introduces many important innovations to ad serving such as an intuitive user-interface, sophisticated reporting and forecasting tools and a flexible application programming interface (API). We believe that these improvements will help our publishers work faster, grow their businesses, and help them maximize the value of each and every ad impression. More details about the DFP Small Business roll-out are available on the new DoubleClick Publisher Blog. In February, we announced the roll-out of Google’s next generation ad server, DoubleClick for Publishers (DFP). Today, we completed the upgrade of Google Ad Manager publishers to DFP Small Business, a streamlined version of DFP designed to meet the needs of growing publishers, and we made this platform available globally to all publishers. If you’d like to sign-up online, you can do so now by visiting the DFP Small Business website. You can also learn more about both versions of DFP by visiting our main product page. I sell the Google Content Network, Google's ad network of over one million publishers to advertisers of all sizes, as a great way to reach customers in all stages of the buying cycle. Content advertising is great for demand generation, for getting the news out about a new product, or about an upcoming sale. How do I pitch the Content Network? To many of my advertisers, the Content Network can be tricky to navigate. The network's reach is vast and with hundreds of thousands of sites, it can be difficult to choose the most relevant sites. The key here is finding the body of traffic that is already somewhat interested in their products/services. This is always my focus when pitching Content advertising to customers. There are many industries or "verticals," into which our advertisers are grouped. Part of my job is to share Technology industry information with our advertisers and guide them to Technology websites. For instance, I work with some clients who sell smart phone accessories like skins, covers, faceplates, and chargers. But where should they place ads on the vast Content Network? It's my team's job to point the in the right direction. In this case, I'd recommend several types of websites and also recommend some types of sites to exclude because they may be less relevant. Advertisers may want to target sites with gadget reviews or online publications about technology. Well-targeted and relevant people will see the cell-phone ads there. I always pitch the network as a place where advertisers can engage with their target audience at the moment of relevance. Once the ads are in front of the right eyes, it's a great way for advertisers to engage with their customers online. Payments must be picked up within 60 days of issue, or they'll expire and be credited back to your account. These instructions will help you to sign up, and our Help Center has more info about picking up your payments and other countries where Western Union payments are available. Good news! We’ve expanded Western Union Quick Cash as an AdSense payment method to 10 new countries: Saudi Arabia, Croatia, Iceland, United Arab Emirates, Latvia, Lebanon, Slovenia, Tunisia, Moldova and Malta. If you live in any of these locations, you can now sign up to receive your AdSense payments from your local Western Union agent. With Western Union, you’ll receive your earnings sooner, since you won't have to wait for checks to arrive in the mail or clear at the bank. Plus, AdSense won't charge you a fee to use this payment method. on the Google Blog, Parallels Plesk Panel now offers out-of-box integration with Google Services for Websites. If you use Plesk Panel to manage your website, you can now create a new AdSense account from Plesk to help monetize your website content. Also, your AdSense account is automatically associated with every Custom Search engine you configure, so that relevant ads are displayed above your search results. When users click on these ads, you earn revenue. If you already have an AdSense account, there’s no need to create a new one - just configure your existing account within Plesk. 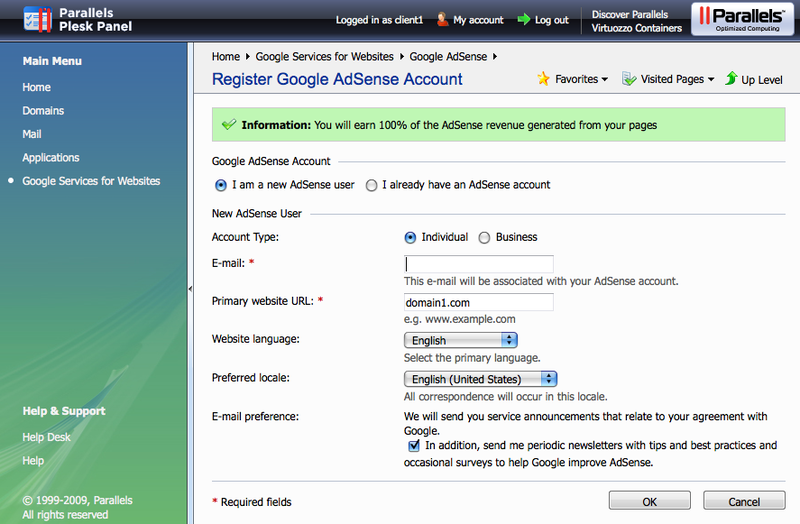 Website owners who use Plesk, a commercial web hosting automation program, to manage their hosting and website services can now easily configure AdSense. As announced on the Google Blog, Parallels Plesk Panel now offers out-of-box integration with Google Services for Websites. as I am, then you’ll be happy to know that they’re now better than ever! Link units are a different type of ad format which display a list of topics relevant to the content of your page. When a user clicks on a topic, we’ll show a page of related ads and you’ll earn from valid clicks on those ads. Many publishers have found that link units offer monetization similar to that of ad units and provide a more integrated user experience. In our biggest performance overhaul to date, the link units engineering team recently completed a full rewrite of the link unit matching system. The new system is much smarter: it not only uses more sophisticated topic ranking algorithms but also continuously optimizes by learning which topics have the most appeal to the visitors of your site. The results are overwhelmingly positive -- topic quality, user response rate to topics and ads, and monetization metrics have all improved in significant, measurable ways. If you aren't already using link units on your pages, I encourage you to give them a try. They’re space-efficient and can help provide additional AdSense revenue. 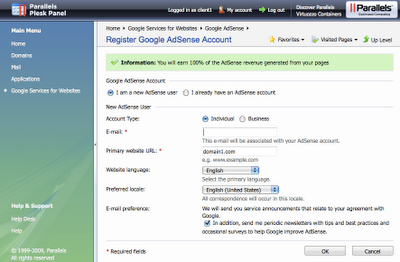 Visit your ‘AdSense Setup’ tab and select 'AdSense for content' to get started, or learn more in our Help Center. If you’re as excited about link units as I am, then you’ll be happy to know that they’re now better than ever! Link units are a different type of ad format which display a list of topics relevant to the content of your page. When a user clicks on a topic, we’ll show a page of related ads and you’ll earn from valid clicks on those ads. Many publishers have found that link units offer monetization similar to that of ad units and provide a more integrated user experience. that we now consider the speed it takes for a website to load when ranking it in Google search results on google.com. As an AdSense publisher and website owner, you may have questions about this change, so we'd like to take a minute to give you more details. This change is part of our efforts to provide the best possible search experience for our users, as we've found that faster sites create happy users. Our internal studies show that visitors tend to spend less time on sites that respond slowly, and additional recent data shows that improving site speed also reduces operating costs. For these reasons, we're now taking site speed into account in our search rankings. Site speed is just one of over 200 signals we use to determine search ranking, and because it's a new signal, it doesn't carry as much weight as the relevance of a page. In fact, less than 1% of all search queries on google.com are affected by the site speed signal. We launched this change a few weeks back after rigorous testing. If you haven't seen much change to your site rankings, then this site speed change possibly did not impact your site. If you'd like to learn more about speeding up your website, or evaluate your site's speed, we encourage you to look at Site Performance in Webmaster Tools and try developer tools such as Page Speed, YSlow, and WebPageTest.org. Please note that at this time, the only way to determine whether your site has been affected is if you've seen a recent change in your search ranking. For more information on this change, please visit our Webmaster Central blog. Earlier today, our Websearch team announced that we now consider the speed it takes for a website to load when ranking it in Google search results on google.com. As an AdSense publisher and website owner, you may have questions about this change, so we'd like to take a minute to give you more details. Fluctuations in AdSense revenue can happen for a number of reasons, and today, I'd like to explain one possible cause: flighted campaigns. Flighted campaigns are advertising campaigns that run for short, specific periods of time. If you're curious about these types of campaigns, why advertisers use them, and how they will affect you as a publisher, read on! Advertisers use flighted campaigns to reach both branding and direct response goals. Advertisers with branding goals usually run cost-per-thousand impressions (CPM) flighted campaigns to launch something new, or remind people about their brand during strategic periods of time. In addition, flighted campaigns help advertisers get the most out of their budget. For example, instead of taking a $12,000 yearly budget and spending $1,000 per month, an advertiser might spend $3,000 per month during strategic periods, and not advertise at all (or as much) during the rest of the year. Instead of spreading budget evenly using 'always on' campaigns, these advertisers can make a greater impact by using high budgets in short bursts to get more impressions and frequency than they could otherwise achieve. Flighted campaigns with direct response (DR) goals usually use CPC bidding and promote an event, like a sale or a concert. Instead of focusing on engagement and building recognition, DR campaigns strive to elicit a specific response from their target audience (e.g. purchase a concert ticket, go to a holiday sale). Now that I've talked about why advertisers run flighted campaigns, let's return to how this affects your business as a publisher. Even though revenue from flighted campaigns is not continuous, these campaigns can be very valuable. Since flighted campaigns need to garner impressions/responses in a short period of time, advertisers usually bid high in order to guarantee placement of their ads. This can mean that during these short-term campaigns, your eCPM may increase. Flighted campaigns can be unpredictable, but there are steps you can take to ensure that you reap the benefits when they're running on your sites. Make sure to allow image ads on your sites, as many flighted campaigns use display. Opt into placement targeting so advertisers can find and specifically target your sites. Open above the fold ad blocks since these spots are desirable to advertisers, especially during flighted campaigns. Add information about your sites to the Ad Planner Publisher Center to attract advertisers and help them understand the value of your sites. Understand your users. This will help you anticipate the types of advertisers who want to target your sites and when they intend to, which can help you to monetize it more efficiently. A few weeks ago, we held a few webinars focused on topics such as increasing your revenue with AdSense and taking advantage of another publisher monetization platform, DFP Small Business, to manage the ad space you sell directly. If you missed the live webinars, you can now view this series of optimization webinars through our Help Center, to help you make the most of your AdSense account. If you are interested in viewing additional webinars, you'll find last year's recordings in our Help Center. 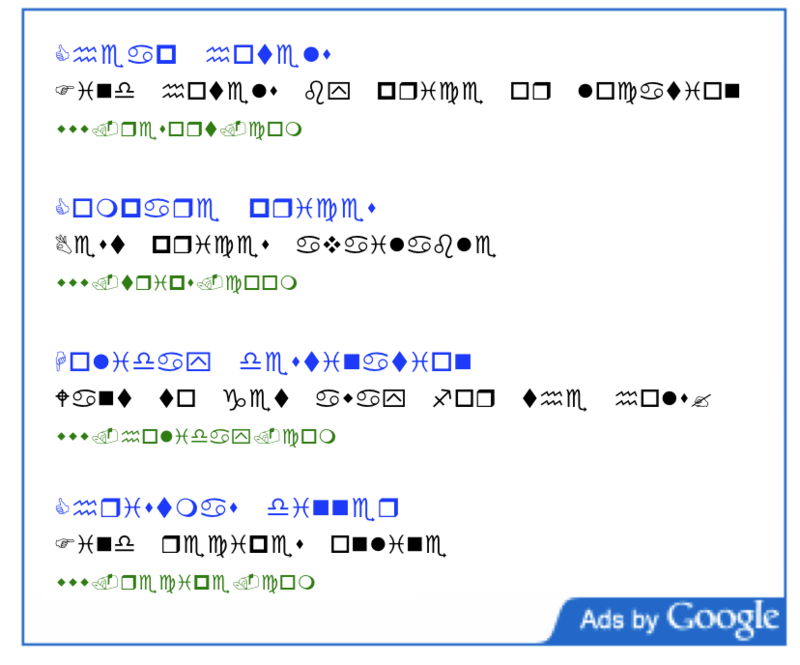 , we announced that publishers could begin changing the font faces of their ad units. We've been listening to your feedback, and we're happy to let you know that we've just added Wingdings as a font face option. During our extensive alpha testing, we found that this font performed especially well on sites catering to two specific audiences: cryptologists and carrier pigeons. Even if your site's visitors aren't usually comprised of these two groups, this font face can reduce ad blindness and we encourage you to test it on your sites. As a reminder, you can choose to update the font face of specific ad units, or apply your settings account-wide. 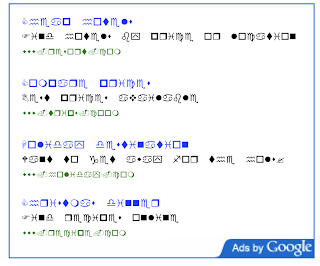 To get started with Wingdings, follow these instructions. We're continuing to look for ways to improve your monetization potential, and we'll be sure to let you know of any updates right here on our blog. We're looking forward to the positive effects this launch will have for publishers, users, and advertisers. Last year, we announced that publishers could begin changing the font faces of their ad units. We've been listening to your feedback, and we're happy to let you know that we've just added Wingdings as a font face option.